From a technical point of view, micro-computed tomography (micro-CT) indeed is a cone beam computed tomography technique which utilizes geometrically cone-shaped beams for reconstruction and back-projection processes. Having a voxel size volumetrically almost one million times smaller than that of computed tomography (CT), micro-CT’s voxel size ranges between 1 and 50 μm. Thanks to this tiny voxel size, micro-CTs provide outstanding cross-sectional resolutions. Micro-CT is currently being utilized in various fields such as biomedical research, materials science, pharmaceutical medicine development and manufacturing, composites, dental research, electronic components, geology, zoology, botany, construction materials, and paper production. Micro-computed tomography makes direct examination of mineralized tissues possible such as the teeth and bones, ceramics, polymers, and biomaterials. Reviewing recent studies conducted within the field of dentistry, it was observed that numerous studies related to concepts such as evaluation of root canal morphology, evaluation of root canal shaping, evaluation of root canal sealing, examination of residual obturation material after root canal retreatment, assessment of craniofacial bone development, and measurement of enamel thickness could be found in literature. In addition to all these, micro-computed tomography is also being utilized as a nondestructive, rapid, and reliable method for analyses of micro-architecture of cortical and trabecular bones. Parameters such as trabecular thickness (Tb.Th), trabeculation number (Tb.N), trabecular separation (Tb.Sp), bone volume (BV), total tissue volume (TV), trabecular bone ratio (BV/TV), structural model index (SMI) that demonstrates numeric features of trabeculation in 3D, trabecular bone junctions, number of trabecular nodes per each tissue volume (N.Nd/TV), and bone density determined with respect to hydroxyapatite amount can be calculated this way. Taking advantage of all these benefits provided by micro-computed tomography, various studies might be conducted in order to shed light on clinical research regarding TMJ. High-quality images of joint components can be attained without deteriorating tissue integrity; these images can be reconstructed in 3D, and microstructural analysis of the joint can thus be performed. 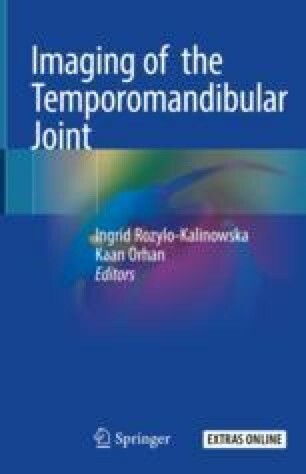 The authors would like to thank Dr. Umut Aksoy for the preparation of micro-computed tomography and TMJ bone histopathology section and providing histopathology and corresponding rat mandibular micro-CT image. All specimens in this chapter were scanned with Skyscan 1275 (Skyscan, Kontich, Belgium) which were taken from the Ankara University Research Fund (Project No:17A0234001).